Confidence in the way you look can help improve your life mentally, physically and socially because good self-esteem goes a long way toward happiness in all aspects of your life. Cosmetic surgery and medical spa treatments are great ways to enhance your appearance and reach your ideal look, but many of these options are costly, leaving patients with fewer choices to enrich their appearance. At Bella Cosmetic Surgery, we offer a variety of payment options, so that you can be on your way to the best you in little to no time. If you’re interested in plastic surgery or non-surgical cosmetic enhancements, please contact Dr. Chiaramonte in Maryland today at (301) 567-6767 to schedule your initial consultation. Our board-certified plastic surgeon and experienced staff serve clients in Washington DC, Maryland and Alexandria and Fairfax, Virginia. The ALPHAEON credit card was designed by plastic surgeons and other physicians who are familiar with elective medical procedures and the financing difficulties many patients face. 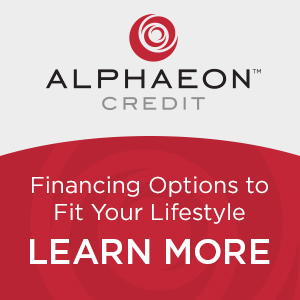 ALPHAEON is a patient financing program, which provides payment plans that meet the specific needs of nearly every patient at Bella Cosmetic Surgery. The credit card offers a wide array of monthly payment options to give you the opportunity to reach your cosmetic and beauty goals. Apply today so you can focus on looking, feeling and being your best! CareCredit® is a popular patient payment program in North America that we are pleased to offer our patients. This financing option allows you to begin your treatments right away and make convenient, monthly payments over time that fit into your budget. You don’t have to save up for years to get the cosmetic treatments you’ve always wanted to improve your appearance and self-confidence. CareCredit® is designed for your health and beauty needs and is exclusively offered for health care services. This credit card gives you the power to decide when cosmetic enhancement is the right time for you. CareCredit® card purchases of $250 to $1,000 may qualify for six months interest-free if they’re paid in full within that time frame! Many of our medical spa treatments such as laser skin resurfacing and CoolSculpting® fall within this price range, giving you the opportunity to get rid of old scars or unwanted fat without the need to save up over the course of several months to a year. *No interested will be charged on the promotional purchase if you pay the promotional purchase amount in full within six months. If you do not, interest will be charged on the promotional purchase from the purchase date. Regular account terms apply to non-promotional purchases and, after promotion ends, to promotional balance. For new accounts: Purchase APR is 26.99%; Minimum interest charge is $2. Existing cardholders should see their credit card agreement for their applicable terms. Subject to credit approval. Minimum monthly payments required. Cosmetic surgeries such as breast augmentation, tummy tucks and mommy makeovers are quite pricey but well worth the price tag. Our board-certified plastic surgeon wants you to look your best, and we believe CareCredit® is one of the top financing options for our patients. CareCredit® card purchases of $1,000 or more may qualify for no interest if paid in full within 12 months! *No interest will be charged on the promotional purchase if you pay the promotional purchase amount in full within 12 months. If you do not, interest will be charged on the promotional purchase from the purchase date. Regular account terms apply to non-promotional purchases and, after promotion ends, to promotional balance. For new accounts: Purchase APR is 26.99%; Minimum interest charge is $2. Existing cardholders should see their credit card agreement for their applicable terms. Subject to credit approval. Minimum monthly payments required. Extended Pay Options Up to 60 Months with CareCredit®! *On qualifying purchases of at least $2,000 made with your CareCredit® card account. 14.90% APR and Fixed Monthly Payments Required Until Paid in Full on qualifying purchases of $2,000 or more made with your CareCredit credit card account. Fixed monthly payment amount based on repayment over 24, 36, 48 or 60-month period. For new accounts: Purchase APR is 26.99%; Minimum Interest Charge is $2. Existing cardholders should see their credit card agreement for their applicable terms. Subject to credit approval. With a single application, Parasail will search loan officers from all the top online lenders without affecting your credit score—You can select the right fixed-term loan option for you. If you’re interested in improving your appearance through plastic surgery or non-surgical cosmetic treatments, you don’t have to worry about finding the funds for your chosen procedure up front. With the financing options we’ve listed, you could be on your way to a better you today without breaking your budget. Schedule your consultation with Dr. Chiaramonte in Maryland today at (301) 567-6767. Bella Cosmetic Surgery serves clients in the Maryland, Washington DC and Virginia areas.